Yvonne's Genealogy Blog: Saturday Night Genealogy Fun -- How Did Your Parents Meet? It’s Saturday (well, now it’s Sunday – I’m a day late) and Randy at Genea-Musings has issued his weekly challenge to his readers. My parents Maurice Belair and Jacqueline Desgroseilliers and their families lived in Blue Water, a village that no longer exists next to Sarnia, Ontario. They first met in about 1951. Mom was about 17 years old and Dad was about 23. Dad was unemployed, but Mom worked at Scripnick Deluxe Confectionery in Blue Water. He used to drop in there, but didn’t notice Mom. One day, though, he did and after that, he regularly visited the store. Dad would chat with Mom while she worked at the lunch counter. Eventually he asked her out on a date. I don’t know how their courtship progressed, but I remember Mom telling me that Dad got along well with her family, especially with her father, Eugène. After dating for a few years, Mom gave Dad an ultimatum. 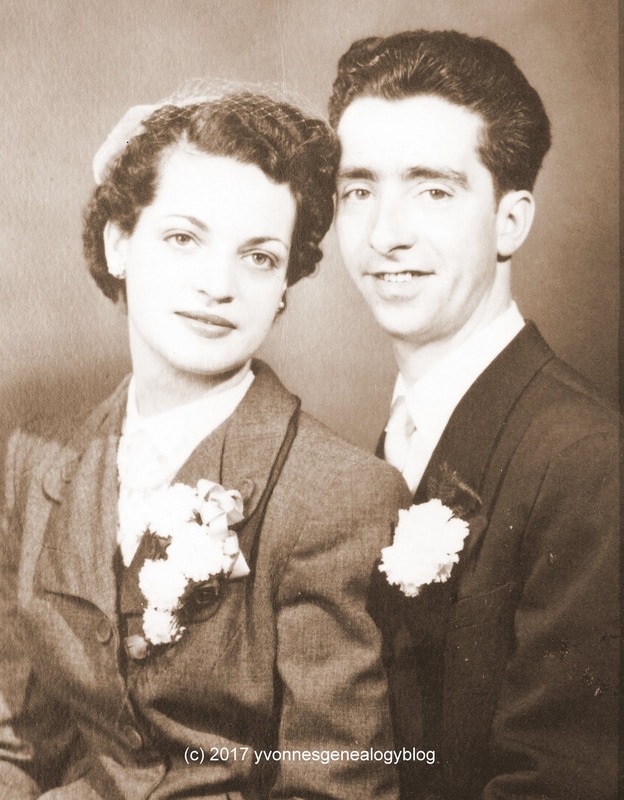 They married soon after on December 18, 1954 in a civil ceremony in Sarnia. They didn’t have much money, so didn’t really have a honeymoon. Instead, they drove to northeastern Ontario to tell her father (he lived with his elder daughter Madeleine in Kirkland Lake) and his parents (Dad’s family lived in Timmins). Mom and Dad celebrated their 41st wedding anniversary in 1995. Dad passed away five months later, but Mom is still with us.